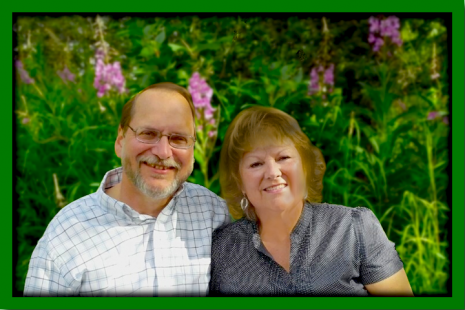 Ted and Marilyn Franke came under the umbrella of Arctic Barnabas Ministries when they joined Alaska Mission Connections in 2012. After nearly twenty-eight years of Christian Camping ministry and connections with ministry leaders all over Alaska, AMC provided a natural progression from their past ministry experience. Alaska Mission Connection (a ministry of ABM) facilitates collaborations among different missions that work around Alaska. Its motto states, "Jesus followers united in mission." Almost daily the Frankes see God at work uniting Alaska's ministry leaders and building connections to effectively evangelize and disciple all of Alaska's people, which greatly encourages them. Ted attended Multnomah School of the Bible in Portland, OR and Marilyn went to Grace Bible Institute in NE. Both graduated with hearts ready to serve the Lord. Ted went on to serve under Arctic Missions Inc., in Pedro Bay, Alaska. He remembers it as a time for those gracious native people in that small village church to train and challenge him in practical Alaskan life experiences. Marilyn went to live in Anchorage, worked at East High School, and lead their Youth for Christ Club for several years. During the summer months, both Ted and Marilyn worked at Victory Bible Camp. Ted Franke and Marilyn Gillespie married in 1980 at Victory Bible Camp. For the first two years of marriage, they served in Anchorage at Chapel by the Sea where Ted directed the youth department. In 1985 Arctic Missions, later known as InterAct Ministries, asked them to consider a move to take over the direction of a small three-week summer camp called Camp Li-Wa near Fairbanks, a recent gift to Arctic Missions. Through God’s guidance, they accepted this call and took on a challenge much more significant than either of them realized at the time. By God's grace and provision, the camp grew into a year-round summer camp and winter conference/retreat center. The primary mission of the summer camp to evangelize young people expanded to disciple and cultivate the growth of future Christian leaders. After twenty-six years of service, up to seven families had joined the permanent staff with significant outreaches into Fairbanks community. God chose to bless this ministry with many lives changed for eternity. The Franke’s consider their capacity to minister to these lives, a privilege granted by God. Ted and Marilyn reside near Palmer, AK.